Publications and media outlets seek input from us about leadership. Here are our latest appearances in publications and media! 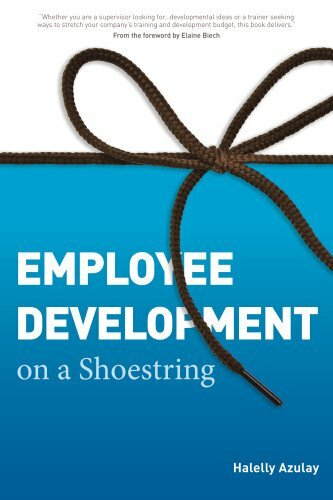 Click on the image on the right to buy Halelly's book, Employee Development on a Shoestring (available in paperback, kindle, and PDF versions from Amazon, ATD, and other major book retailers). Learn more about the book here. NewsChannel8: Halelly Azulay is interviewed on ABC affiliate NewsChannel8's "Let's Talk Live" where she shared "The 3 Keys to Communication Success"
TV: Interviewed by Sheila Savar on the power of networking and the benefits of getting involved with a professional association. Filmed in April 2008 and first aired in June 2008 on Fairfax Public Access, Fairfax, VA, USA. Part 1 and Part 2. See my post on it here. Sales & Marketing Management - Combating Disengagement: What Can Be Done About Workers’ Lack of Interest in their Jobs? Quora - What Books Should Learning and Development Executives Read? LinkedIn article by Stephanie Cronjé - Mindset - Everyday is an Adventure + Value-Creator! Book: Halelly Azulay is a contributor of the article "What's an Engaging Facilitator" to the book, The Art and Science of Training, by Elaine Biech, hailed as "the new bible for training professionals" by Ken Blanchard! Book: Halelly Azulay is a contributing author of two items to 101 More Ways to Make Training Active (Wiley), edited by Elaine Biech. BOOK: Strength to Strength: How Working From Your Strengths Can Help You Lead a More Fulfilling Life by Halelly Azulay. Click on the image to the left to get a copy!